"Barre Pinske - Modern, Folk, and Fine Art"
Welcome to Barre Pinske's Web Site there is much to see here. A Barre Pinske google search will also prove interesting. You will find stories on my career and see images of my work a number of places on line. Enjoy! I recently made a four minute video of art work I have created over 30 years I hope you like it.. I am very happy to announce the launching of our new product the "Welcome Bear" from Barre Pinske's Vermont Wooden Bear Co. It is so rewarding to be able to work with a team of talented people to bring this staple to the wooden bear to market. We are now able to offer hand finished like products to customers around the World from our shop here in Chester Vermont. The original bear design came from my friend Joe Rego. I modified that design with the help of Joe Lupiani, a CAD designer, we were able to scan the bear and modify it hold the heart or wooden Welcome sign. The bears are cut out on my CNC machine with the finish carving is done by my self. Welcome Bears sell for $275. Also new this winter, is the launch of our Etsy Shop, where you will be able to purchase our shippable size bears, hearts, and other carvings directly. We are adding new items to the shop frequently, so check back often to see what we are up to! The Gallery in Chester Vermont is cranking with commissions. I would love to keep people up to date with what I am working on in the studio. My Barre Pinske Face Book is provably the best place to see what's happening. The Big Buzz Chainsaw Carving Festival was a big success again with thirty carvers attending last year. The Big Buzz happens annually over Columbus day weekend. This year will be year eight! There is a Big Buzz Facebook page also. 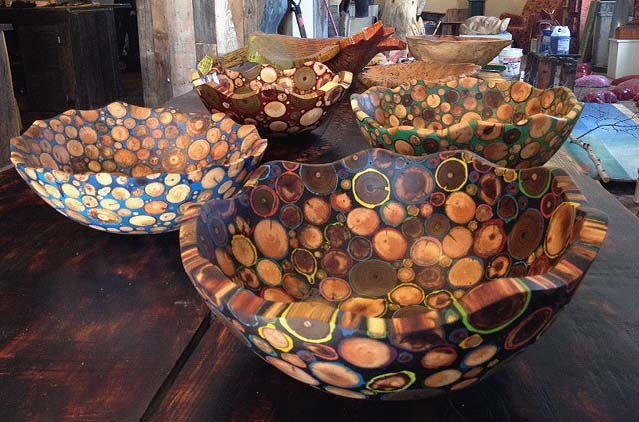 Here are pictures of our very cool Twig and Resin bowls. Made with a process I developed, you will not find anything like this product for this price anywhere. Call or email to find out about Twig and Resun work. This is the new Items for sale link. I have some of the items in the gallery available to You online. Check out the Pinske Hydraulic chain saw in operation from this link too! For direct purchase of shippable bears and other items, check out our new Etsy Shop! A live web cam stream from Barre Pinske Studio! Click here for daily information from Pinske Studio and other Chainsaw carvers from around the world. Having talent is like owning a huge warehouse filled with very cool things. To get things out of the warehouse an artist needs time, inspiration and patrons. Affording the light bill in the warehouse not to mention the heat is a very important thing! When collectors buy, it creates an opportunity for the artist to enter the building and look around for the next wonderful piece to bring out for the world to see. Ideas and patronage are equally important as talent. Whether it's something simple as an exercise or an opportunity to push creative limits all commissioned work is very important. Collectors have lead me to creative places I would not have gone alone. That experience is a big part of what I love about creativity and quality relationships. If you have a creative project you would like us to consider please e-mail me. As a young man I was told by many people I had a gift. When I needed to make a career choice I decided if I did not pursue an art career and share my gift it would be like a present left wrapped and unopened. That was thirty years ago. As a maturing artist I look forward to more success and working with more of the interesting types of people who have passed my way. We have one shot at life having a goal of creating significant work with respect to art and meeting cool people make my life a truly wonderful experience. Thanks to all of you who have given me the opportunity to keep creating. I'm very excited to see my works coming up on the secondary market. I would love to become collectable It's every artist's dream. Although I started my career as a wood sculptor I work in many mediums. Images of selected artworks are shown in categories by clicking the button bars on either side of top of this page. To see the most images of my art work click the photo archive button on the top left. I have over 100 photos of my work in the archive. 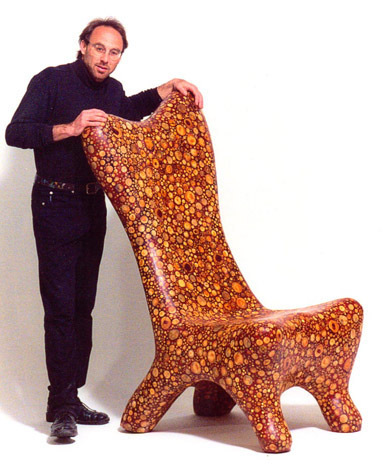 This chair is made from branches and resin. The chair took 300 hours to create. The chair has a plywood core for structure which I glued ridged foam to and sculpted it to shape. The foam was covered with a resin and wood dust mix. 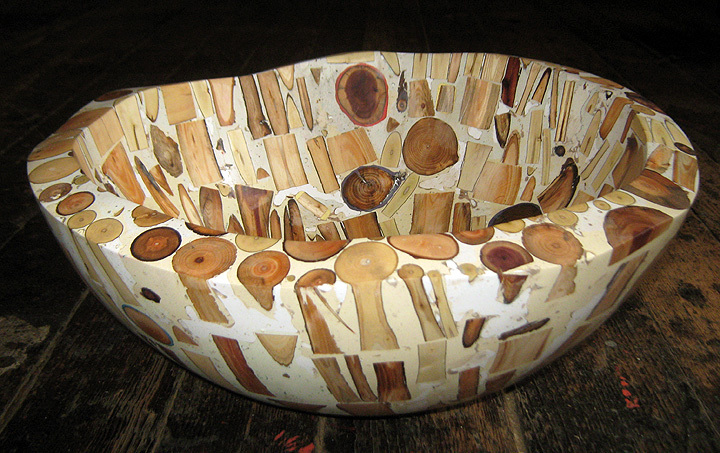 The branches were attached one by one to the shell and flooded with filled and pigmented resin. Click on the Chairs Button Bar to the right then on the twig chair to see pictures of the Twig Chair in process it is really cool. All Web Site images enlarge by click unless it is a link. 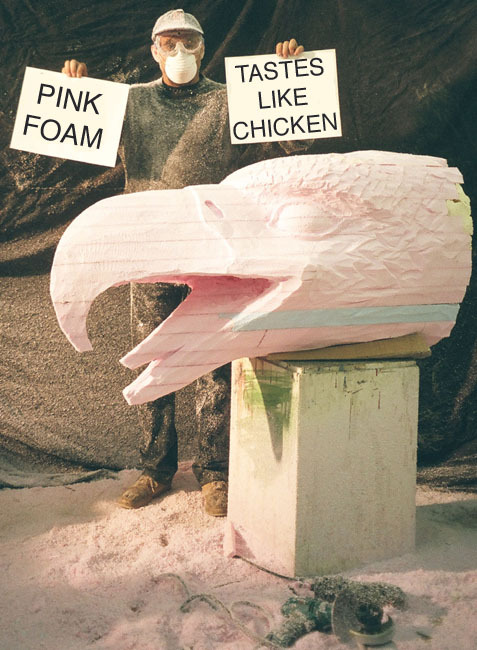 This is a funny picture of me with a sculpted foam eagle head. The foam core was coated with filled resin and fiberglass. The foam is carved with a wire brush on a die grinder and sanding tools. The static cling of the foam is a pain but it carves easy and will not rot like wood. This sculpture was a commission for Steven Tyler. The eagle head is off of the deck on his home recording studio. Here I am with Steven Tyler in my New Bedford Gallery in 2002. Steven and his then wife Teresa came down to see the 23' slide I was making as an alternative way to get from the main house to the pool house. I made the Paper Love seat we are sitting on in 1998.